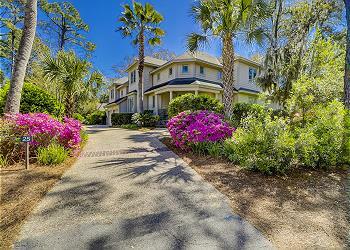 Welcome home to outdoor island living, and indoor open space at its best. 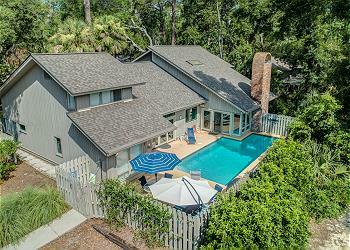 This 4th-row Sea Pines home has an expansive deck with a gorgeous *private heated pool, spa, and built-in gas grill with plenty of room for lounging under swaying palms and dining al fresco. Step in off the deck to a flowing and spacious space that includes the living room. Plus, the suite on the 2nd floor has a private balcony overlooking the pool area. There’s a beach path right behind the house that in just a 2-minute flip flop walk will have you enjoying all the fun and sun the island has to offer. •	Private *heated pool and spa (15 x 32) This pool & spa have a gas heater and can be heated for an additional fee of $575-$875 + tax per week depending on the season. If you would like to heat the spa only, the cost per week is $225 + tax.